アマチュア無線関係の自作備忘録としてのblogです。最近は部品調達も段々難しくなってきました。多くの方の情報交換が出来れば幸いです。 This blog as a making memorandum on an amateur HAM radio Homebrew. Parts supply was also becoming difficult gradually recently. I should be very much obliged if you can do much person's communication. 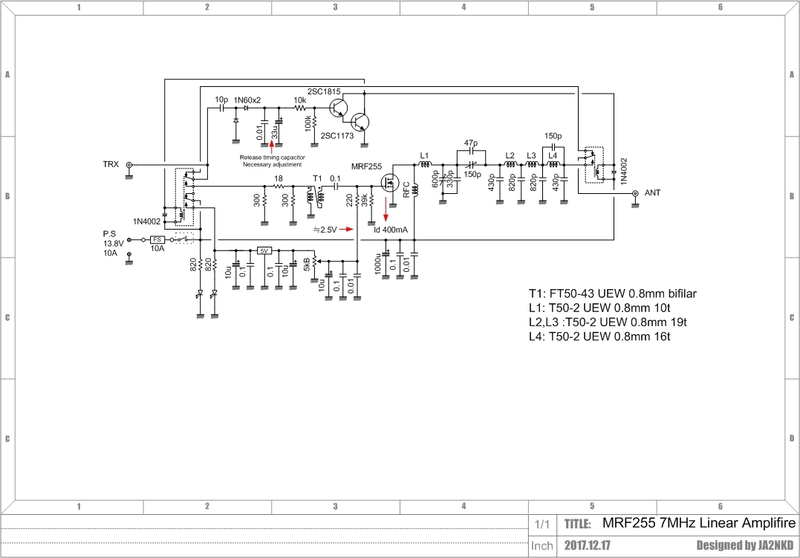 Recently I made the ultimate SSB transceiver called Knobless Wonder(VK3YE). On the good condition, It's possible to QSO with the whole in my country(JA). It's was a big surprise. However, with 2W output, there are days when QSO can not be done quite easily due to poor radio condition recently. . So I made a linear amplifier. I hope to get 10 watts. I found MRF 255 from the parts box. It is said that IMD is not good, but I think that it is reasonable FET to use lightly. 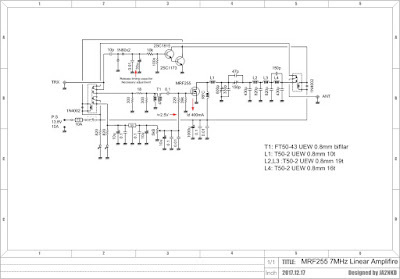 It is also nice to use it with a power supply voltage of 12 V.
The circuit considered ease of manufacture, certainty and efficiency to some extent. Matching of inputs is difficult. This time it was adopted because it was broadband and compared with direct connection, compared with 4: 1 and 1: 4 where 1: 4 was the most efficient. It seems that input impedance is higher than I expected. Since Knobless Wonder is 2 W output, it was designed to drive with 1 W with a 3 dB attenuator. The output is a narrow band of LC. This is to increase efficiency and to be dedicated to Knobless Wonder. Idling current set 400 mA. With this, we could output up to 35 W peak. 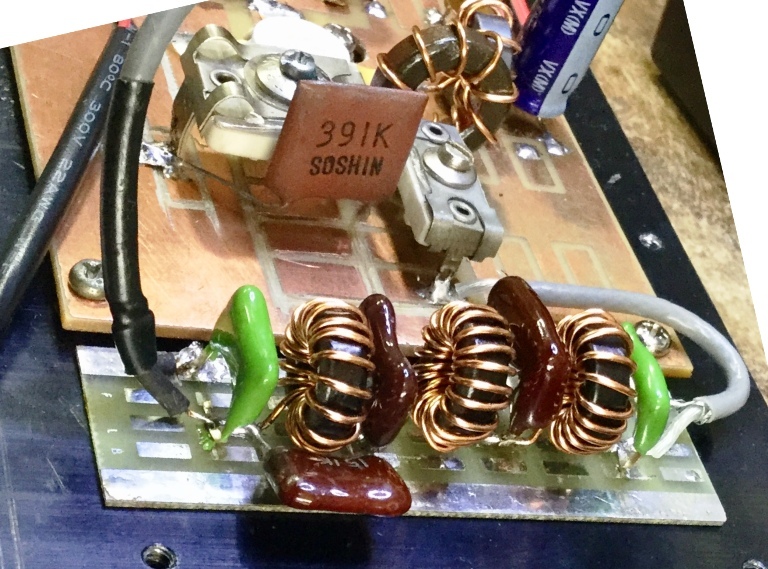 It seems that 50 W is possible if the input circuit is narrowband type LC, but I thought that it would be sufficient if we could produce easily and 10 W could be done, and it was completed with this. The peak Id was about 8 A.
Incidentally, LPF is indispensable for output. Since it is a single FET this time, in order to cut the second harmonic wave further, it is set to constant K type 2 steps plus polar filter(14 MHz). As a result, it was marginal to laws and ordinances. If you plan to make it in the future, I think that it is good to have fixed K type three-stage plus polarity.